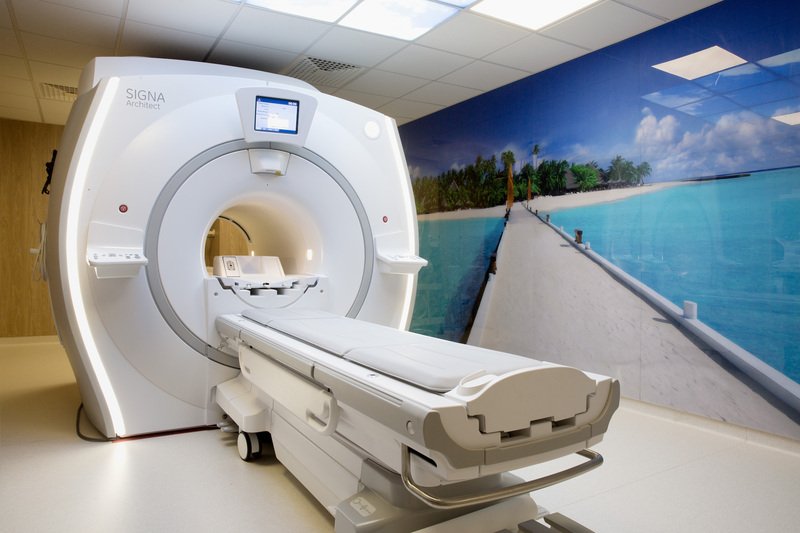 Magnetic resonance imaging (MRI) is a non-irradiating imaging technique producing two- or three-dimensional body images with an excellent contrast resolution. This constantly evolving technique has revolutionized medical imaging and has already been the topic of 5 Nobel prizes. Our institute is equipped with a last generation high-tech 3T MRI, the General Electric (GE) MRI Signa Architect, making IICC a reference center for this constructor. IICC is indeed the only centre in Switzerland operating this 3T MRI model, which is generally only installed in state-of-the-art university hospitals mostly dedicated to clinical research, as its powerful gradients coupled with last-generation coils (known as air coils) offer higher quality images and numerous advanced application possibilities in functional imaging (among others in neuroradiology). Among its outstanding points, this MRI is provided with a new 48-channel head coil (new coil technology, known as air coils), which, associated with new techniques of acceleration (called compressed sensing) and simultaneous acquisition (called hyperband) of sequences, allows a significant gain in terms of anatomical resolution (in particular for tractography) or examination time (particularly useful in case of acute stroke or claustrophobic patients). The Signa Architect MR has already been the subject of conference presentations (including Pr. Denis Ducreux’s one during the French Meeting of Radiology in October 2017: download the video of his presentation). This MR system is also provided with three-dimensional elastography which allows in particular to assess liver fibrosis, and thus to perform a full (morphological, perfusional and elastographic) evaluation of liver in the follow-up of chronic hepatic diseases. Elastography can be performed in our institute using both ultrasonography or MR imaging, thus allowing an « all-in-one » (morphological and functional) liver assessment on a first-line (ultrasonography) or second-line (MR) imaging technique. 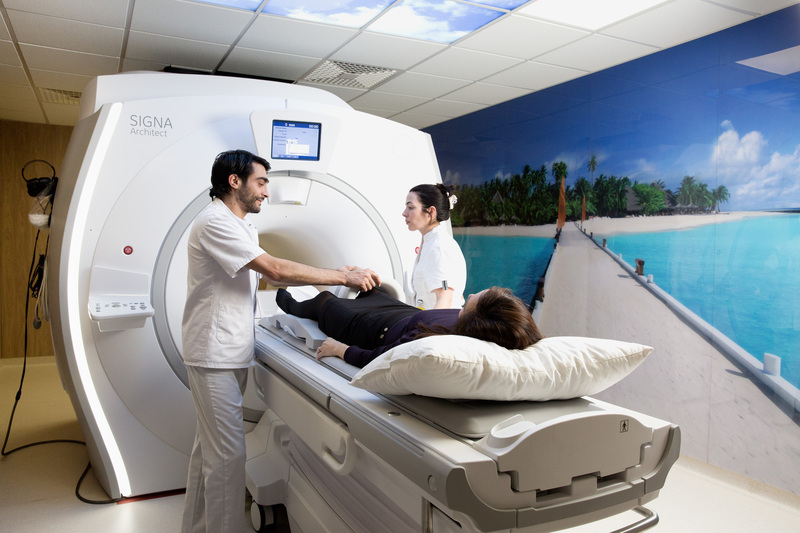 The design of the MRI room has been aimed at making the environment as pleasant as possible (with a wall silkscreen printing and ceiling backlit slabs), allowing to minimize any feeling of claustrophobia.